Often grocery stores will advertise a great price on meat like $1.99 for pork loin or $1.49 for round steak. In the fine print (or after you get to the store if you're like me) you'll find that the price is only good for the "Family Pack" or "Valu-Pack." That means you have to buy a huge package that costs significantly more than you might have planned to spend. I usually go ahead and buy the large package because in the long run I'll be saving money. For example, buying an extra (or four extra - ahem) turkey at Thanksgiving because it's only $0.29/lb, or buying a whole case (40#) of boneless, skinless chicken breast at $1.61/lb, or buying a 6# package of round steak when it's $1.29/lb means cheaper meat for several months. 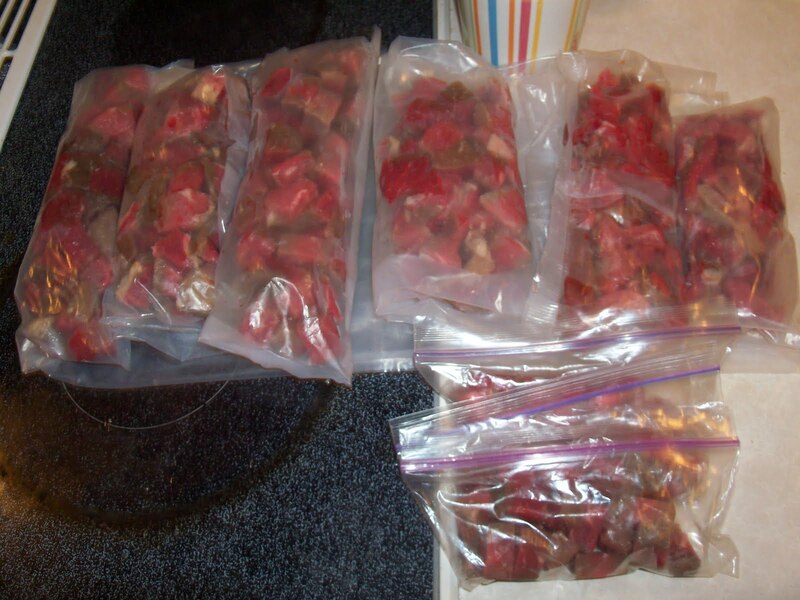 Recently I bought one of those valu-packs of round steak and when I got it home I portioned it all out so it'll be quick & easy to use for meals later. 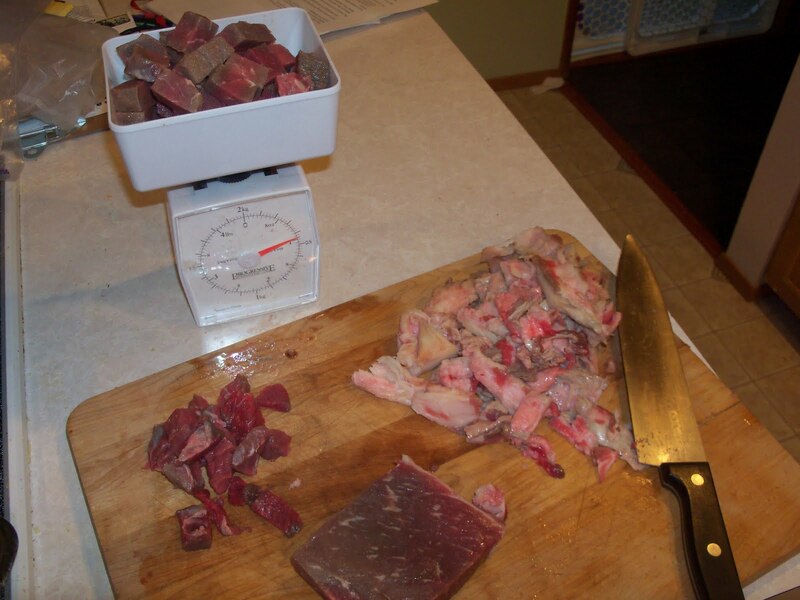 I generally use a scale for this job and trim off excess fat as you can see in the photo below. When I had portioned out the meat I had 4 packages of cubed round steak to make stew and 2 packages of meat strips for beef stroganoff. I also made myself three little packages of cubed meat so I could make myself a treat of steak & eggs for breakfast a few times. The packages are all labeled and put in the freezer until I need them for a meal at a later date. It's a much faster dinner preparation when the meat is already cut up and ready to toss in the pot, too. Note that for the larger packages of meat I used recycled cereal bags. They're nice and thick and do a great job of preventing freezer burn with the added bonus of not paying for new Ziploc bags. Katie, how do you seal the cereal bags? I don't generally seal the cereal bags. I tried using rubber bands but the rubber doesn't hold up in the freezer. As it turns out the meat sits in the bottom of the bag and I can just roll it up in the rest of the bag and air doesn't get in. I've also used paper clips and binder clips on the folded bag and that works well, too, though those don't stack as well as the plain rolled up packages.